The hand that giveth taketh away. Such is life on the Offa’s Dyke Path, or to be fair, the weather on the path. Yesterday – joy. Today – misery. It had all started off so well too. I rejoined Offa’s Dyke Path after leaving Llanarmon-yn-Iâl. I was looking forward to an exhilarating day’s walking. This particular stretch of the ODP skims around several of the peaks in the Clwydian Range of mountains. The views are spectacular. On a fine day, that is. No sooner had I joined the path aiming for Foel Fenlli peak that it started to rain. It was manageable at the start. The usual waterproof routine was put into action and I continued. However the path became steep, and was muddy from the previous days’ showers. As the path zigzagged, the visibility deteriorated. The clouds descended and suddenly there were no views whatsoever. I was hungry and despite the rain decided to have lunch at Bwlch Pen Barras, which is essentially the car park for Moel Famau. I managed to find a bit of shelter and ate a packet of crisps which I’d bought at the Community Shop in Llanarmon earlier. The rain came down heavier. 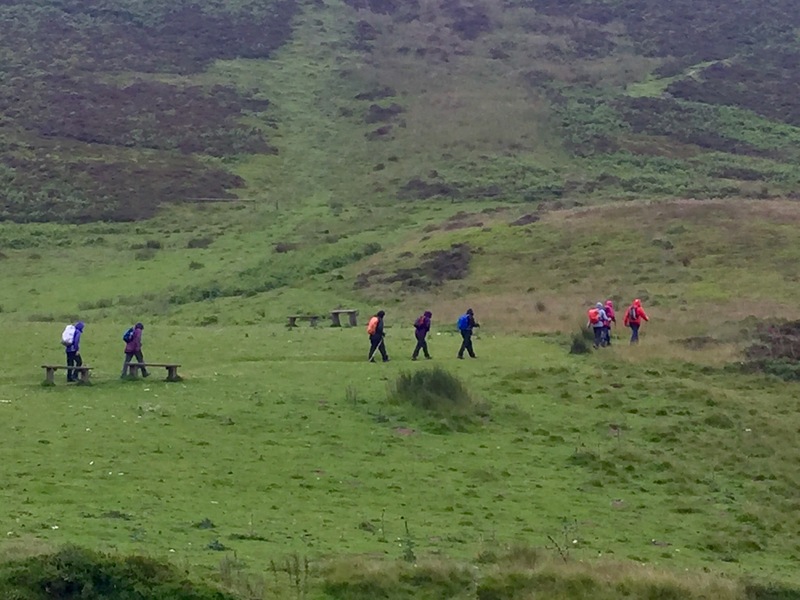 A bedraggled group of walkers came past looking glum. I psyched myself up after I’d finished eating, checked my pack and waterproofs and set off in the driving rain, following the path. On a fine day, I would have taken a detour in order to reach the summit of Moel Famau, but in this weather? No chance! I walked on in misery. The rain had breached my shoes by this point and I had two buckets of water on my feet once more. Slosh slosh slosh. Still, my new rain jacket was working (!) so at least my torso was dry. I saw information points with the local history attached but the rain was so heavy I couldn’t even stop to read. So I made a promise to return on a fine day in order to enjoy these peaks properly, as well as the numerous hill forts and other features that I was missing out on. I got to Bodfari and sloshed into the Downing Arms where I was able to regroup, dry off in the loos (a bit) and have an orange juice. The relief!! I looked at the map. Should I stop here or continue? I decided in all my drenched wisdom to go on to Rhuallt. My reasoning was that I was already soaked and miserable, so why not get as far as possible today and leave an easier final day for tomorrow. In for a penny, in for a pound, right? Feeling chuffed with myself I started out again. When I saw the ridiculously steep hill in front of me, I immediately regretted my choice. I very nearly turned on my heels and made for the campsite nearby but no, on I walked. After crossing fields and going down numerous country paths I walked into Rhuallt. My relief was Olympic. Especially when I made my way to camp to set up for the night. Just one more day to go on the Offa’s Dyke Path. Tomorrow I would reach Prestatyn. It’s a shame about the weather. The views from Moel Famau are fantastic on a clear day, with Yr Wyddfa and Tryfan clearly visible to the west. Enjoy your last day on ODP/LCO and good luck! Yes I was gutted. Shall have to return on another day! I did the same for similar reasons but took the road route instead via Capel-y-Ffin. Better safe than sorry, especially when trekking alone. And yes that is a bit steep going out of Bodfari !!!! 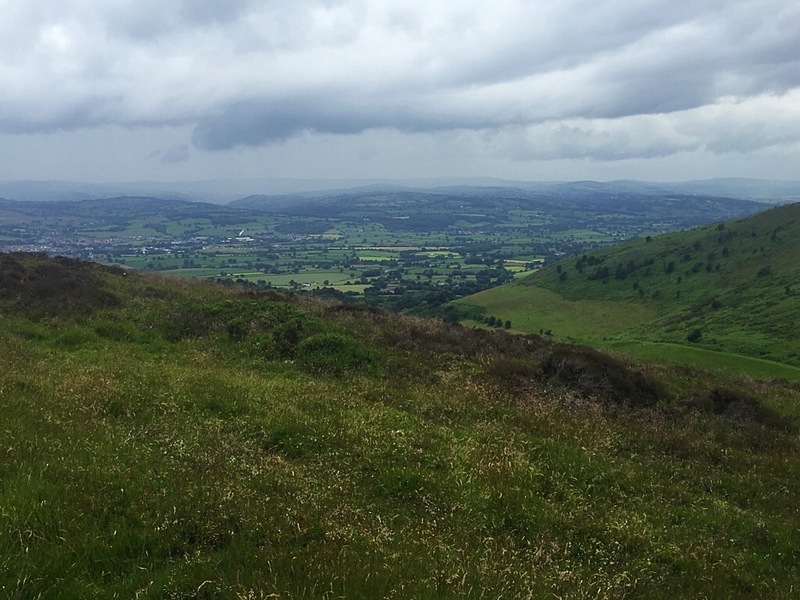 Despite everything that has been thrown at you on the Offa’s Dyke path, you have conquered all. Back on the coast path now and hopefully the weather will start being a whole lot kinder. Wnes ti’n dda i ddal ati yn y tywydd uffernol yna heddiw Siriol! Lle fyddi di erbyn dydd Sadwrn ti’n meddwl? Dwi awydd dod i gerdded!